October. The most beautiful month. That is what a South African poet, C. Louis Leipoldt, called October and I have to agree with him. This morning when I woke up I was aware of the soft sunlight just tinting the grey morning sky and birds were happily twittering outside our bedroom window. Their song of gratitude humbled me. They are filled with such joy and they trust implicitly in the goodness of the day to come. 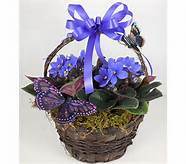 In my garden I have a pot with violets. They give a delightful splash of colour to the surroundings still struggling to shake the grip of the drought. Their gay purple blooms lift my spirit. On closer inspection I notice that some of the leaves are bruised and broken and some of the petals have blemishes. Yet, despite these imperfections, it is a beautiful display joy and abundance, a testimony of the beautiful creation of God. Amongst the blooms I notice a spider spinning its web, I see a worm wriggling deeper into the ground and I behold how a butterfly gently settles on one of the flowers. Its yellow spotted wings quivering in the light breeze. Looking at this microcosm, I realized that it resembles our lives. Each of us is a flower planted in the garden of life. Everyone of us has a few blemishes, some of us are a bit broken or bruised, we have worms and spiders in our soil and amongst our leaves, but that is not the sum total of who we are. We are also beautiful, we have a sweet fragrance and we can give shelter and sustenance to others. Most of us are quick to notice the faults and mistakes of others, we enjoy pointing out their weaknesses and revel in their misfortune. We seldom look for the good in others. We appoint ourselves as judges over the lives of others and pat ourselves on the shoulder, because we are so perfect. In the process, we become destroyers of beauty. We are like a swarm of locusts that devour everything in our path. Where does it stop? It stops with me. Today I will choose beauty. I will search for that which is good. I will hold onto every morsel of goodness and I will celebrate even the tiniest piece of beauty crossing my path. We are all a little bit fragile, delicate like the wings of a butterfly. I will be a shelter for all who need a haven from the storms, and even though my petals are a bit blemished I will still bloom as beautifully as possible in order to be a witness of my Creator. Even if the whole world only see my imperfections, my Creator knows the very essence of my being and I was good enough for Him. Today, please choose beauty with me.